Exploring caves is a thrilling hobby that is becoming more popular as people seek various ways to stay active and entertained at the same time. Known as spelunking in the U.S. and Canada and potholing in the U.K. and Ireland, it introduces parts of nature that people have never seen before. Caverns and hollows are fascinating and mysterious. Sleeping in one overnight is in many ways preferable than booking a conventional hotel. The advantages of staying in a cave room are numerous – no humidity, constant cool temperature, serenity and calmness, and no crowds or loud noises. Camping in a cave is in many ways a lot more challenging than even the most dangerous places for sleeping outdoors. The space can range from tiny enclosed spaces that will have you twist your body in weird shapes to massive grottos through which you can probably drive your van. Some caves can be closed to the public for health reasons. If the place you want to visit is on private property, you may be able to get in, but you need to know before you pack and hit the road. You also want to know as much as possible about the potential risk of animals or extreme weather getting in the way of exploring the cave. Flash flooding can be an issue, as many hikers know if they have been to The Narrows, a dangerous place in Zion National Park. Unexpected and abrupt flash flooding is common year-round. Hypothermia is also a major concern. Caves are fragile in a sense that everything affects them. Touching formations discolors them and stops growth, according to NPS. Lint from clothing coats walls and formations, changing the very “fabric” of the limestone. 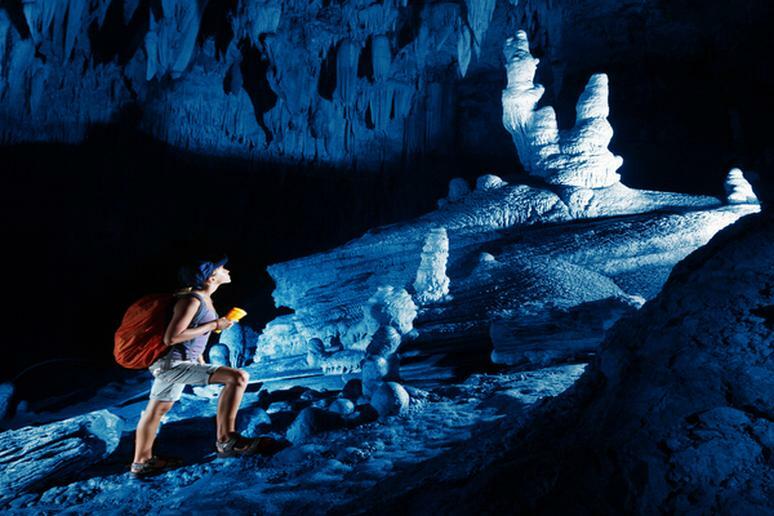 Electric lights show off the beauty of caves, but also promote desiccation and algae growth. Debris brought in on shoes can change the chemistry of pools and upset the nutrient balance. Anything brought in from the surface affects everything under the surface. Some caves have bat populations of 20 million, making caves a vital area for this beneficial but misunderstood mammal. Most of them live near the entrance. Food and energy become more limited as they go farther into the cave. You don’t want to wake up the bats that are hibernating. You can actually kill them if they wake up before they should because they won’t have enough food to survive, according to National Geographic. You are going to get dirty no matter what you wear. So bring something you don’t mind tearing or staining forever. Don’t expect to stay clean unless you just peak inside to see what a cave looks like and get out. Bring some spare clothes in a bag to change in later when you’re done exploring the cave. You should always have at least on flashlight per person, helmets, jackets or anything you wear when it’s cold, and strong shoes like boots. Knee pads may be a good idea if you have to do a lot of crawling. Your clothes should be long and preferably polypropylene or something else that isn't cotton. Gloves are optional as they can get in the way but at least they will keep your hands warm. Never forget to bring water, anywhere you go. You can survive for weeks without food, but just a few days without H2O. Also, bring a skanky nalgene to pee into – you don’t want to do that in a cave. Caves can be dangerous. Whether you’re just walking around or sleeping, unexpected things can and do happen all the time. You won’t have cell phone service so forget about calling rescue teams. The only people that can help are the people you’re with on this adventure. Bring at least one person who has been in the cave before. If you don’t have such friends, go on a guided tour. Don’t split up from the group. Caving is not meant to be a solitary sport; make it a social event. Caving is not like flying – if there is a problem, you can actually do something and don’t have to sit hoping that the pilot knows what to do. But you need to know how to react in any case of emergency – if there is a flood, how to treat an injury if rocks fall (which is common), if somehow you or someone from the groups gets lost, or what to do if you experience symptoms of hypothermia.